Climate change threatens ecosystems, small communities, and cities in Colombia. Much of this has to do with water. Water is necessary to life. Too little and communities cannot survive, too much and communities are overrun. Water links the Chingaza-La Caja-El Rosario-Bogotá area together. 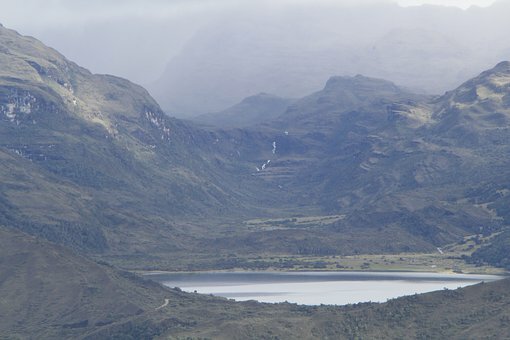 Chingaza, a páramo (wet, high-altitude, Andean grassland) has species adapted to high levels of water, the small veredas (rural outpost communities) of La Caja and El Rosario depend on predictable precipitation for their farming, and Bogotá depends on a functioning páramo for their water source. Climate change hazards threaten all of this, especially given the high exposure and vulnerability of certain areas. Thankfully, though, these communities also have resilient aspects and there are many steps that are being taken and that can be expanded upon to support these unique and valuable communities. Latin America is a very important region, because it has the highest levels of biodiversity on the planet, as well as some very fast growing economies, leading to pressure between conservation and development (IPCC 2014). 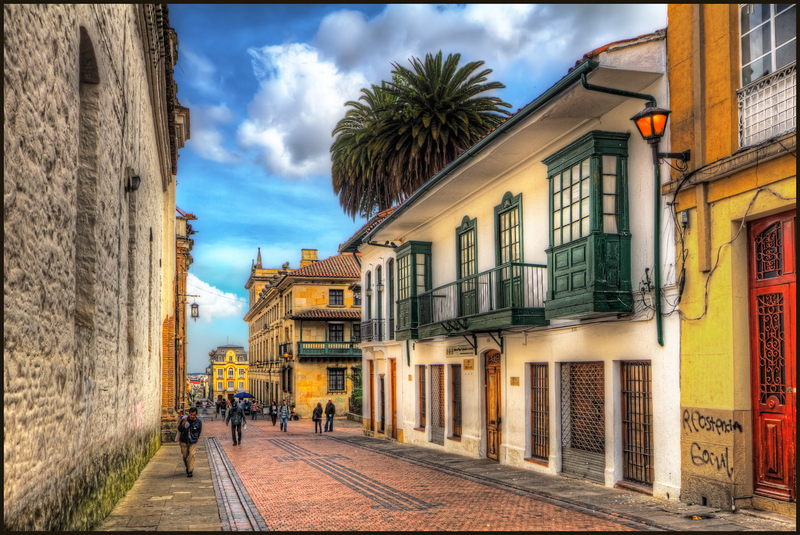 Colombia is the 3rd most populous country in Latin America and has many unique ecosystems, including rainforests, tropical glaciers, and coastal zones. It also has páramos, which are wet, high alpine grasslands unique to the Andes (Fecht 2018). Chingaza is a National Natural Park protecting a páramo. 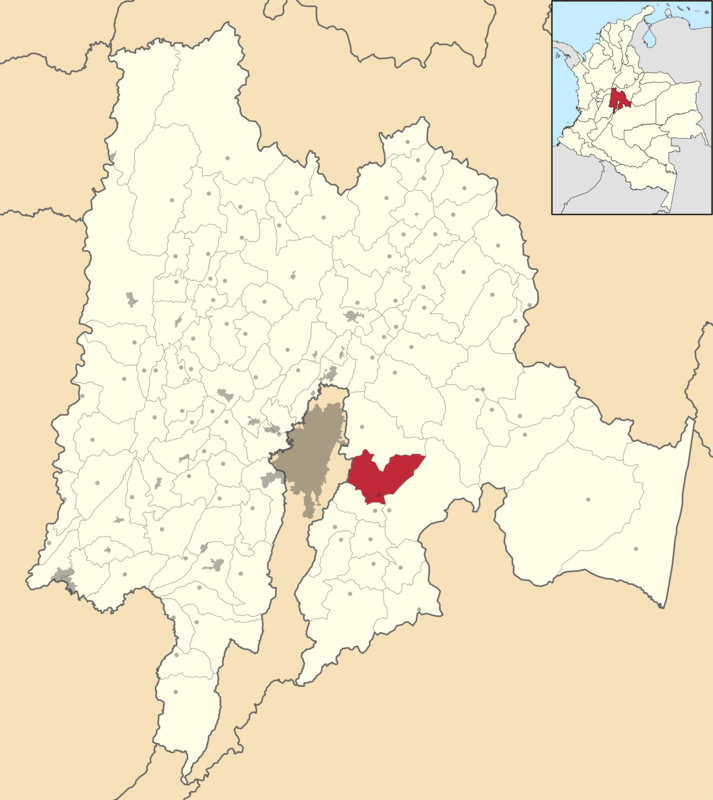 Farmers live both on its outskirts and illegally within the park in the veredas (rural outpost settlements) of La Caja and El Rosario that are part of the town of Choachí (Hofstede et al. 2015). Bogotá, a city of eight million and the capital of Colombia, is 70 km away and depends on the páramo for their water (Hofstede et al. 2015). Páramos are an incredibly unique and important ecosystems for their role in water regulation. They are cold and humid ecosystems (Luteyn n.d.). They are also high altitude ecosystems. The exact altitude of páramos vary, with estimates of their varying widely between 9,100 (Madriñán, Cortés, Richardson 2013) and 12,500 ft. (Fecht 2018). Days in the páramo generally start off clear but get more foggy and rainy throughout the day (Luteyn n.d.; Fecht 2018). That cycle is part of how the páramos get their water. Clouds settle in valleys overnight, but then rise up to the páramo throughout the day, bringing moisture (Fecht 2018). 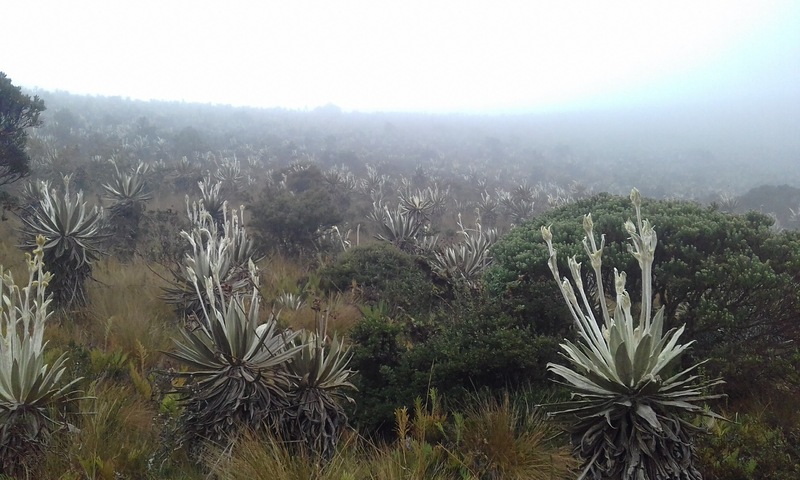 The plants (especially the iconic frailejón) of the páramo help to get this water to the soil (Fecht 2018; Spanne 2012). 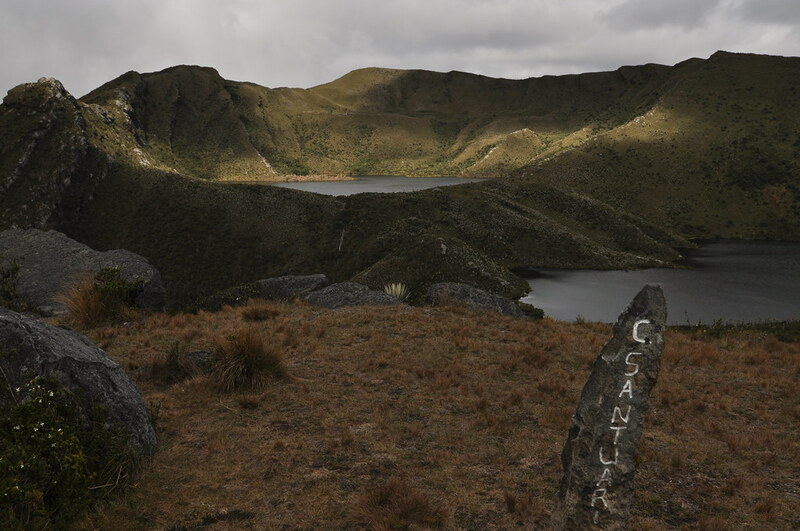 The páramo soil holds significant amounts of water and helps to regulate flow downstream to both provide water and prevent flooding (Spanne 2012). 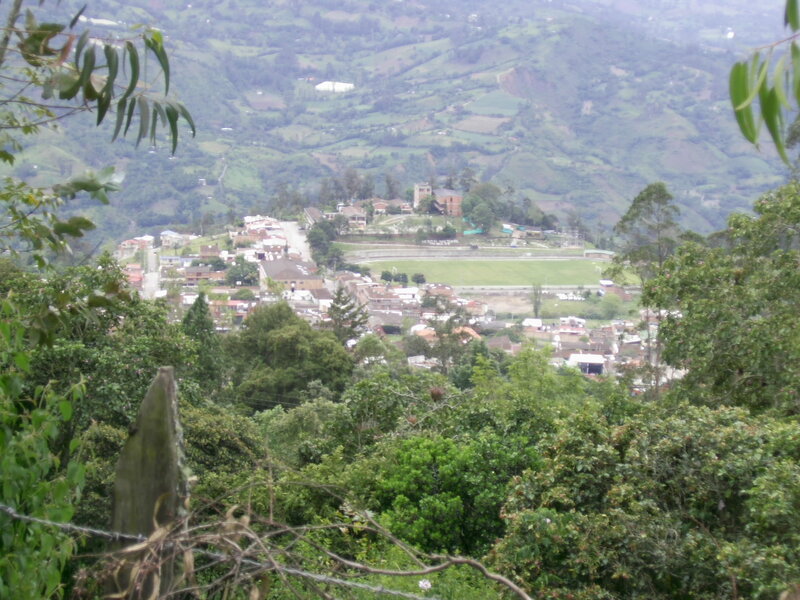 The Chingaza-La Caja-El Rosario-Bogotá region are exposed to a few serious climate change hazards. The páramos may have already warmed 1ºC in the past 20 years, though some estimates are a lower estimate of .1 to .22ºC per decade (IPCC 2014, IDEAM et al. 2014b). Either way, the páramo is warming faster than the global average. It is also facing changes in precipitation that are unclear and seemingly hyper localized (IPCC 2014, IDEAM et al. 2014b, Hofstede et al. 2015). Local knowledge strongly suggests there is decreasing precipitation, with occasional more extreme events (Hofstede et al. 2015). With these changes comes possible additional hazards that affect each aspect of the Chingaza-La Caja-El Rosario-Bogotá area differently, depending on their exposure. 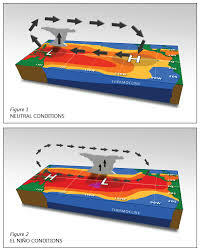 A related climate hazard is the intensification and increased frequency of events related to the El Niño Southern Oscillation (ENSO) cycle (DNP 2012). These cycles are huge drivers of precipitation in Colombia. El Niño years in Colombia are associated with decreased precipitation and drought, while La Niña years are associated with increased precipitation and flooding (DNP 2012). With these changes comes possible additional hazards that affect each aspect of the Chingaza-La Caja-El Rosario-Bogotá area differently, depending on their exposure. Chingaza’s species that are endemic to the páramo are particularly exposed to hazards of temperature increases and may be driven out of the area (Ramirez-Villegas et al. 2014). The communities of La Caja and El Rosario are exposed to both temperature increases and precipitation changes as they are dependent on the land for agriculture (Hofstede et al. 2015). This makes them vulnerable to changes in production. The farmers are starting to have trouble timing their planting due to these changes (Hofstede et al. 2015). La Caja and El Rosario are susceptible to landslides as well (IDEAM et al. 2014b; Hofstede et al. 2014). Also, since they are in the Andes, they may be exposed to an increase in malaria (DNP 2012). However, Bogotá is the real area that will face significant exposure to a lack of drinking water (Buytaert and Bièvre 2012). Chingaza is vulnerable, because it is a páramo. Since páramos are changing quickly and contain species adapted specifically to them, they are vulnerable to severe decreases in biodiversity (IDEAM et al. 2014b, Ramirez-Villegas 2014). The veredas are vulnerable due to low socioeconomic capacity (IDEAM et al. 2014b, Hofstede et al. 2015). Also, these areas have faced increasing sickness, they believe due to pesticide use (Hofstede et al. 2015). 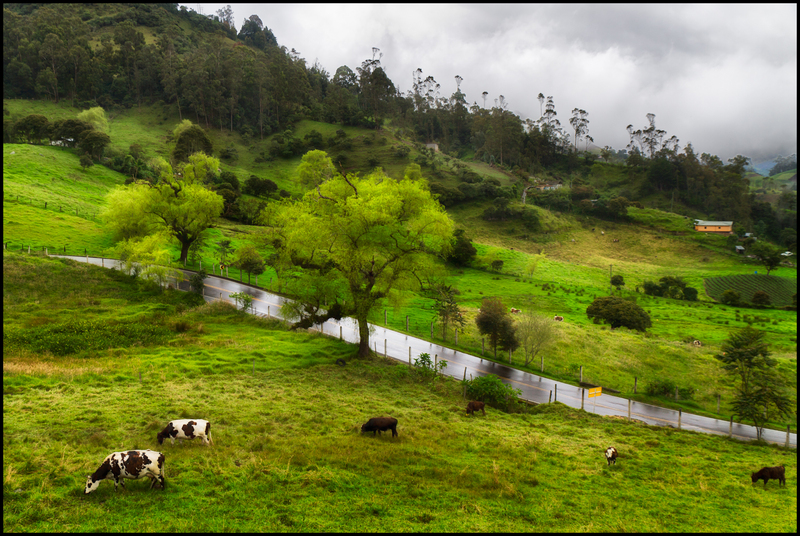 Bogotá is growing quickly, which increases its water demand and is very close to the headwaters of its drinking water sources, which makes it vulnerable to changes in precipitation (Buytaert and Bièvre 2012). 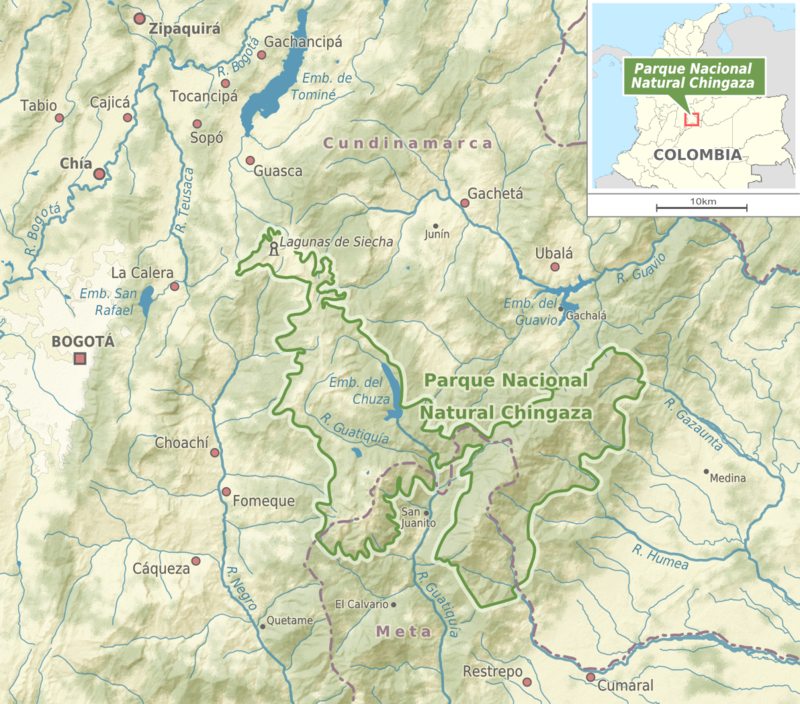 As a national park, Chingaza faces fewer development pressures and is more resistant than other páramos that Bogotá relies on (Sherriff 2018). La Caja and El Rosario are resilient because of their knowledge, willingness to share their experiences, and their ability to make their voices heard throughout research projects. 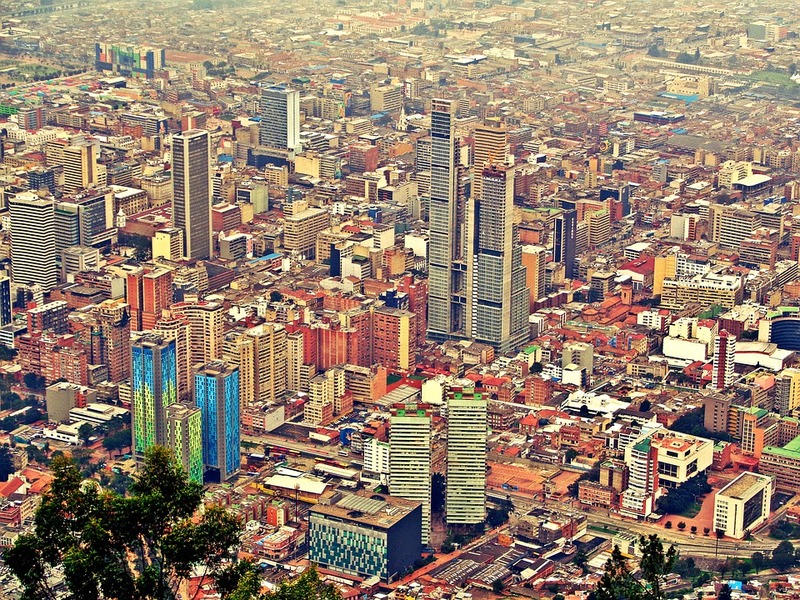 Bogotá is resilient because of its high visibility (as the capital). It is unclear how far implementation has come; however, Cundinamarca (the department of Colombia where La Caja, El Rosario, and most of Chingaza is located) and Bogotá have a regional adaptation project (IDEAM et al. 2014a). Continuing the cycle of implementation and assessment is crucial. Also, rural villages have been included in NGO research but should have their voices included more in the governance process. This is integral to respecting their self-determination, while also making sure that farming does not degrade water sources (Hofstede et al. 2015). It is also important to invest in increasing their standard of living. Finally, Bogotá’s water crisis will primarily be fueled by population growth, so it is important to conserve water per capita or slow the growth (Buytaert and Bièvre 2012). Buytaert, W., & De Bièvre, B. (2012). Water for cities: the impact of climate change and demographic growth in the Tropical Andes. Water Resources Research 48(8). Retrieved from https://doi.org/10.1029/2011WR011755. Departamento Nacional de Planeación. (2012). Adaptación Bases Conceptuales. Bogotá D.C., Colombia: Imprenta Nacional de Colombia. Fecht, S. (2018, Nov 15). This unique Andean ecosystem is warming almost as fast as the Arctic. Columbia University. 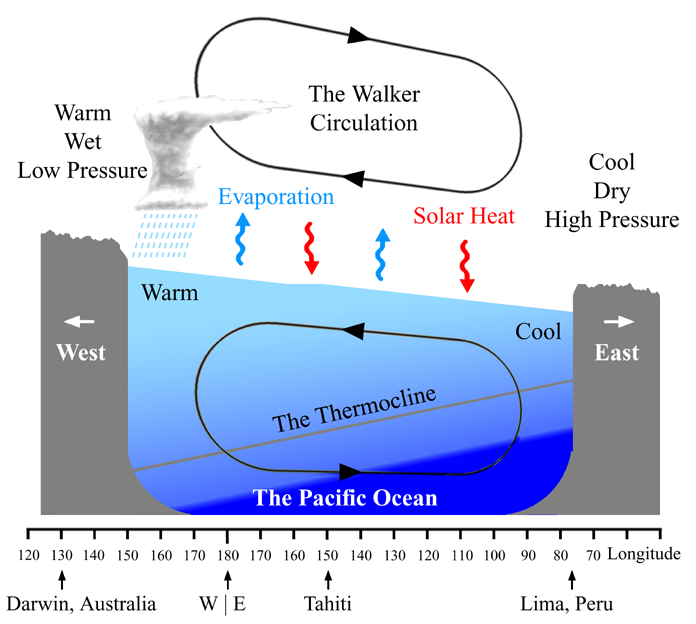 Retrieved from https://blogs.ei.columbia.edu/2018/11/15/paramos-ecosystem-climate-change/. Hofstede, R., Vásconez, S., & Cerra, M (Eds.). (2015). Vivir en los páramos: percepciones, vulnerabilidades, capacidades y gobernanza ante el cambio climático. Quito, Ecuador: Unión Internacional para la Conservación de la Naturaleza y de los Recursos Naturales. IDEAM, PNUD, Alcaldía de Bogotá, Gobernación de Cundinamarca, CAR, Corpoguavio, Instituto Alexander von Humboldt, Parques Nacionales Naturales de Colombia, MADS, DNP. (2014a). Gestión del Cambio Climático con Enfoque Territorial en la Región Capital: Apoyo al fortalecimiento institucional y a los tomadores de decisiones. Plan Regional Integral de Cambio Climático para Bogotá Cundinamarca (PRICC). Retrieved from http://www.ideam.gov.co/documents/40860/609198/LIBRO+DIPLOMADO+_+Gesti%C3%B3n+del+Cambio+Clim%C3%A1tico+_+Regi%C3%B3n+Capital.pdf/5e77bda2-1772-4b19-8bcd-4e417782cf26?version=1.2. IDEAM, PNUD, Alcaldía de Bogotá, Gobernación de Cundinamarca, CAR, Corpoguavio, Instituto Alexander von Humboldt, Parques Nacionales Naturales de Colombia, MADS, DNP. (2014b). Vulnerabilidad de la región capital a los efectos del cambio climático. 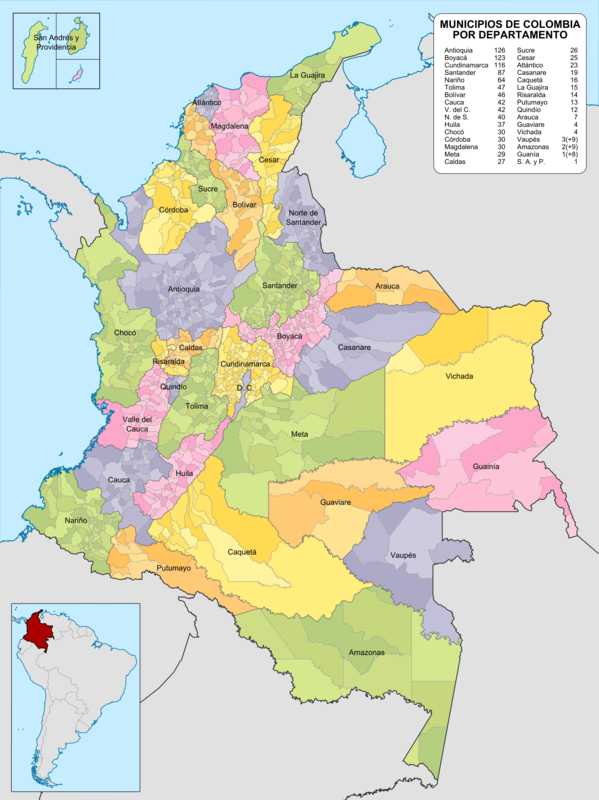 Plan Regional Integral de Cambio Climático para Bogotá Cundinamarca (PRICC). Retrieved from http://www.cambioclimatico.gov.co/documents/40860/609198/Policy+paper_05_Vulnerabilidad+de+la+Regi%C3%B3n+Capital.pdf/4b603362-a58b-4a8b-898d-4df500b2536f?version=1.1. IPCC. (2014). Central and South America. In climate change 2014: impacts, adaptation, and vulnerability. Part B: regional aspects. Contribution of Working Group II to the Fifth Assessment Report of the Intergovernmental Panel on Climate Change (1499-1566). New York, NY: Cambridge University Press. Luteyn, J.L. (n.d.). "Páramo Ecosystem." Retreived from http://www.mobot.org/MOBOT/research/paramo_ecosystem/introduction.shtml. Madriñan, S., Cortés, A.J., & Richardson, J.E. (2013). 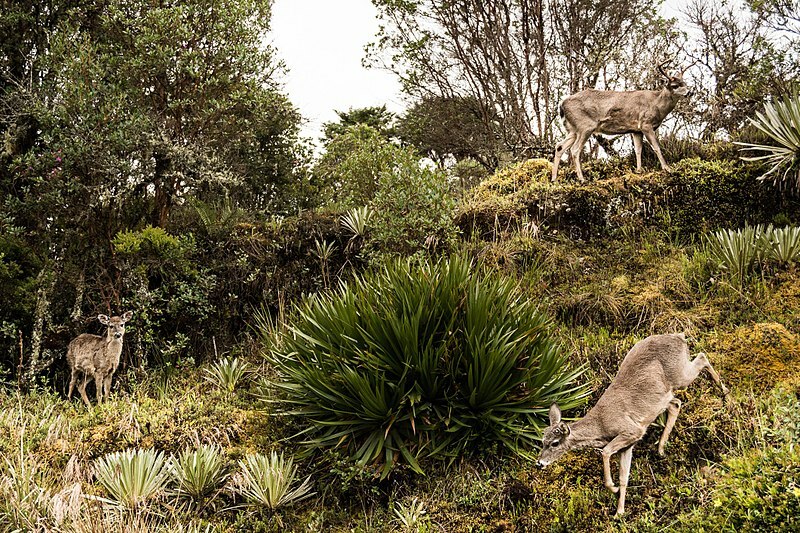 Páramo is world's fastest evolving and coolest biodiversity hotspot. Frontiers in Genetics 4, 1-7. Retrieved from doi: 10.3389/fgene.2013.00192. Ramirez-Villegas, J., Cuesta, F., Devenish, C., Peralvo, M., Jarvis, A., & Arnillos, C.A. (2014). Using species distribution models for designing conservation strategies of Tropical Andean biodiversity under climate change. Journal for Nature Conservation 22(5), 391-404. Retrieved from https://doi.org/10.1016/j.jnc.2014.03.007. Sherriff, L. (2018, June 13). Why Bogotá should worry about its water. CityLab. Retrieved from https://www.citylab.com/environment/2018/06/why-bogota-should-worry-about-its-water/562655/. Spanne, A. (2012, December 3). South American cities face flood risk due to Andes meltdown. Scientific American. Retrieved from https://www.scientificamerican.com/article/south-american-cities-face-flood-risk-due-to-andes-meltdown/. Lucy Hochschartner (St. Lawrence University class of 2020) made this webpage for her Adaptation to Climate Change class. She was an Environmental Studies and Government double major and is interested in climate change science and policy. 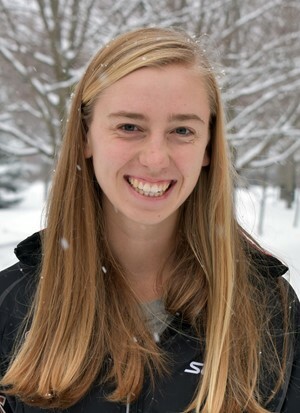 She also competed for the Nordic Ski Team and loves to get outside in the snow or in the Adirondack mountains in the summer.